Neumann TLM-103 Based on the legendary U87 microphone, the TLM-103 is a top class vocal (and all around) microphone with a balanced tone suitable for many applications. AKG C414 (times 3) Another classic microphone, the 414 is the go to drum overhead mic but the versatility of this work horse is as broad as your ability to think of a new way to make noise. AEA R84 Ribbon Microphone (times 2): One of the strong points of FRS as far as mics go, this one is based on the old RCA 44 ribbon mic and uses a thin, vibrating band of metal to create its sound. Sennheiser MD-421 (times 4): A studio and stage standard on drums, horns, percussion, and other instruments. Probably the best tom tom mic made. Shure Beta and SM series and AKG dynamic mics: We have an entire drawer full of Shure dynamic and small diaphragm condenser mics including a Beta 52, Beta 56’s, 57’s, and 58’s, an SM-94, a pair of 137’s and an AKG D-112 kick mic (for a more complete list see the Studio A page for a complete list. API 3124 4-channel solid state mic preamp The 3124 uses the same exact circuit found in API’s large analog mixing consoles (312 x 4, hence the name 3124). Used on more major albums than we could possibly list here. Daking Mic Pre IV 4-channel mic preamp: What can we say–it makes everything sound really good. Very similar in design to the Trident large analog console microphone pres used by Pink Floyd, and countless others. Universal Audio 2610 Tube Preamp (2 channels): Another legend, this preamp delivers a classic analog tube sound from the Universal Audio consoles. Manley TNT (2 channels): Our secret weapon of preamps from one of the industry’s most famous manufacturers. It has two distinct preamp channels: one is identical to the SLAM! tube mic pre (considered a Godsend on bass guitar), and the other solid state channel is based on the old British console preamps. 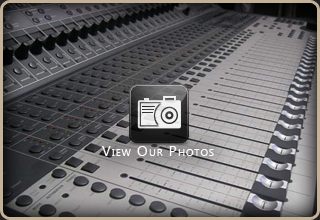 Focusrite Control 24 Console Preamps: Our mixing console also comes with 16, Class A mic preamps that are far from the ‘last choice’ in our set-up despite having some seriously strong company.